Leica AG presents a new option for Leica Trinovid binoculars. The Leica Trinovid 8x42 and Leica Trinovid 10x42 models are now on sale as sets including a Field StationTM outdoor belt-pack from the Lowepro Optics SeriesTM. The combination of a pair of Leica binoculars and a Lowepro belt-pack is the ideal choice of equipment for birding and observing wildlife. For beginners and experienced birders alike, potential buyers of one of these sets benefit in more ways than one: as the Lowepro belt-pack is included at no extra cost, they get more high quality equipment for the same price. The set price is namely exactly the same as the price of the Leica Trinovid binoculars alone. 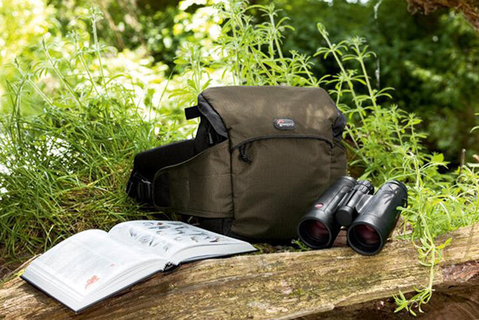 The Leica Trinovid models are counted among the classics of the Leica binoculars range. They are characterised by excellent optical and mechanical quality and stand for ultimate precision and extremely robust and durable construction. Further advantages are their compact size and low weight that, in combination with perfect ergonomics and the excellent grip characteristics of their armouring, guarantee comfortable and secure handling. The Leica Trinovid 8x42 is an all-round glass. The magnification factor of 8× ensures very steady viewing and is particularly suitable for Long and fatigue-free observation. The Leica Trinovid 10x42 brings distant objects close enough to touch. A 10× magnification factor allows detailed Observation of even the smallest objects and makes the Leica Trinovid models the ideal companion for birders and wildlife watchers in every situation. Either of the two Trinovid models can be safely and securely stowed away in the padded binoculars pocket of the premium quality, Lowepro Field StationTM belt-pack. As the belt-pack opens away from the body, it offers fast and easy access to ist content whenever it's needed. The pack's innovative, integrated clipboard is ideal as a rigid platform for a notebook, field guide or tablet computer. Additional inner pockets ensure that mobile phones, keys and other personal belongings can be tidily stowed away. The inner compartment of the belt-pack is so roomy that it offers ample space not only for a pair of Leica Trinovid binoculars, but also for a field guide and a camera. Outer pockets offer additional space for carrying food and drink. A padded waist belt that can be adapted to the carrier's body and the weight of the equipment ensures extremely comfortable carrying at all times. The set comprising Leica Trinovid binoculars and a Lowepro Field StationTM outdoor belt-pack are on sale now at authorised Leica dealers.